We have always known the Florence Mill to have two markers, but the webteam leader has found a third, more ancient marker. Do you know where it was found? This marker may no longer exist so you may not be able to see it if you visit the mill. It appears that this marker is the basis for Marker Two. Granted some of the original text is missing so the translation is a good guess partially based on Marker Two's text. 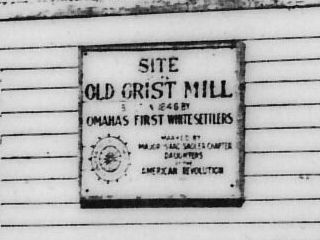 This marker can be seen at the apex of the image on an old photo of the mill, right above the word WEBER.